The Building Love campaign has celebrated a milestone moment with a 'Topping Out' ceremony on 30 May, 2017. Traditionally, Topping Out marks the laying of the final structural beam or the last roof piece in a building project by placing a living tree on top of the highest point of the structure. 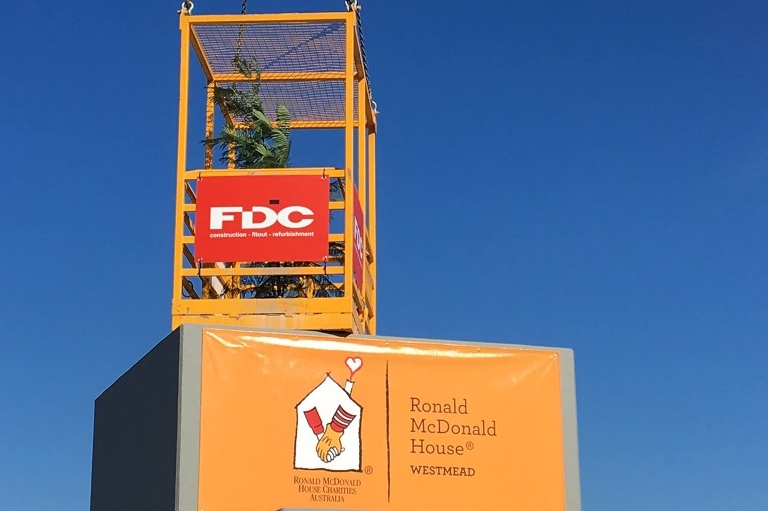 For our own Topping Out event, the builders working on the new Ronald McDonald House Westmead site, FDC Construction, were joined by our Ambassador Mark Ferguson and our good friends at 7 News Sydney as we placed a living Jacaranda onto the roof of the new House. In this case, a building milestone also coincided with a significant marker in the Building Love fundraising campaign, with an amount of $2 million needed to reach our final fundraising goal.